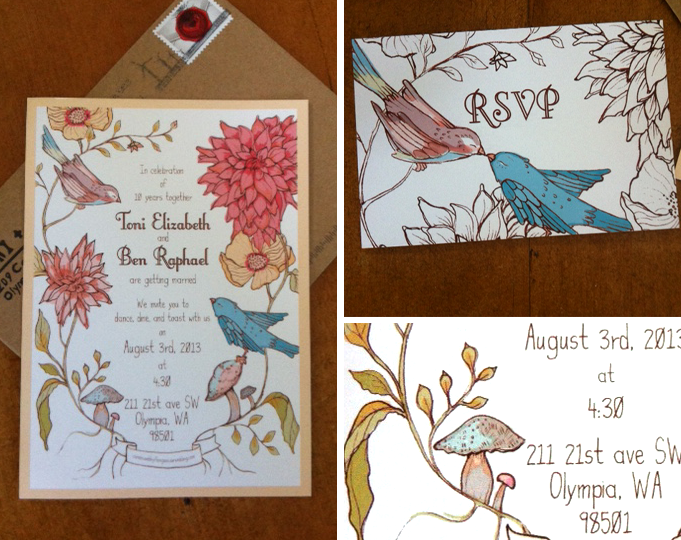 I recently had the honor of designing wedding invitations for my dear friend and pen pal Toni Carnes. I love receiving hand written snail mail ( long live the post office! ) so imagine my excitement when I opened my mail-box yesterday and found a stickered and stamped envelope containing my colorful creations. Sometimes I am lucky enough to do a little drawing outside the studio. I never know when I will get the urge to put pen to paper so I always keep my sketchbook handy...even poolside. A little joy in the mail-box goes a long way. It's going to be a foot stomping, tamale eating, good time. Olympia or bust!